Dekorative Kunst was founded by H. (Hugo) Bruckmann (1863-1941), in association with the art critic J. (Julius) Meier-Graefe (1867-1935) and the writer and publisher Georg Hirth (1841-1916). The journal focused exclusively on contemporary decorative and applied art, particularly furniture, interior design, ceramics, glass, jewelry, metalwork and textiles. It played a significant role in promoting the Art Nouveau and Arts and Crafts movements in Germany. In its early years, coverage was international, however, after c.1910 the journal concentrated more on the German and Austrian art. 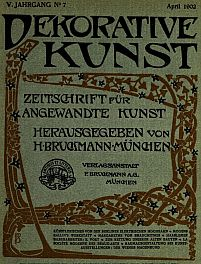 Notable among contributors to Dekorative Kunst were the art dealer S. (Siegfied) Bing (1838-1905), and the writer/designers Henry van de Velde (1863-1957) and Hermann Muthesius (1861-1927). Among the numerous artists and designers whose work feature in the journal are Peter Behrens, Richard Riemerschmid, C.R. Ashbee, M.H. Baillie Scott, C.F.A. Voysey, C.R. Mackintosh, Josef Hoffmann, Koloman Moser and Gustav Klimt.